Spiff: Is it cool if I swear? Jim: Yeah, we encourage it! Spiff: Really?! Man I love this f*cking place! 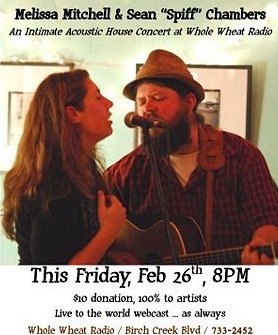 A heads up in case you've forgotten, the Melissa Mitchell and Spiff house concert at Whole Wheat Radio will be starting 20:00 Alaska time, which translates to 13:00 Singapore and 15:30 Aussie Central Daylight Whatsit. Recently I wanted to ask my dad if he'd got his new bicycle frame yet, but I didn't want to confuse him into thinking I was talking about his motorbike — which he also owns but needs some repairs — so I asked about his acoustic bike. Allegedly he's still telling his friends about his dopey son :D.
Anyway I'm frantically off down the road to get a cup of coffee before it starts!